So you have a bad day at work, like the Bulls did Saturday in blowing a 12-point late fourth quarter lead and losing to the Dallas Mavericks on Dirk Nowitzki’s three-pointer. But then it’s Easter Sunday the next day and you need a break; you need to have some fun and laugh. So you take a trip to NateWorld, like the Bulls did late in Sunday’s 95-94 win over the Pistons as Luol Deng’s 28 points with 11 of 17 from the free throw line and Jimmy Butler’s career-high five steals and 16 points helped put a smile back on their teammates’ faces. You ride a bit on Nate’s Tower of Terror, like the three and 20-footers that missed with the Bulls having come back from a 13-point deficit and hanging on to an 85-84 lead with 5:14 remaining. When you are at NateWorld the fun hardly stops there. After Butler pressured Greg Monroe into what became Butler’s third steal of the quarter, Deng, who has been carrying the Bulls of late with Joakim Noah, Richard Hamilton and Marco Belinelli out injured again and averaging 23.6 the last five games, made his third three of the game for an 88-84 Bulls lead. There is always excitement in NateWorld as Thibodeau relied on a diminutive group with Deng, Butler, Taj Gibson, Robinson and Daequan Cook playing much of the fourth quarter. Butler’s defense forced Stuckey into a miss, after which Robinson ran down and fired off a wild runner in his small world after all. Charlie Villanueva rebounded the ball. But Nate came up behind him and swiped it away. Deng got the ball, and then Nate asked for it back in another of his Peter Pan excursions. “Lu got the ball and handed it to me,” said Robinson. “Lu knew I was going to shoot it. I had that look in my eye. Give me the ball. I always have that look.” Is there a Little Thunder? Robinson made the three with 3:55 left for the Bulls biggest lead of the game, 91-84, and it seemed the 18th consecutive win over the Pistons was assured. But the Pistons weren’t done and the Bulls were still close enough to Nate’s Splash Mountain to rest too easily. Monroe, who had 18 points and 11 rebounds as the Pistons outrebounded the Bulls 45-37, scored on a pass from Rodney Stuckey, who led Detroit with 25. 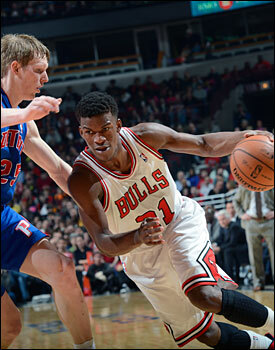 91-86 Bulls with 3:33 left. Deng then rimmed a three and Nate was floating around in the middle of the lane somewhere while his man, Brandon Knight, was jumping up and down calling for the ball. Knight made the three, and now the Bulls were ahead 91-89 with 2:50 left. 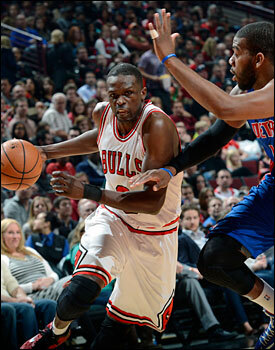 Deng, whose 17 free throws were a career high, was fouled as his constant movement befuddled the Pistons. He made one of two as the Bulls had another Sum of All Thrills at the line with 27 of 40, the latter a team high attempts for the season. The teams traded misses before Stuckey brought Detroit within one at 92-91 with 1:46 left in a two-man game he had working with Monroe. Nate then went flying in off balance like he was riding the Nate Thunder Railroad, his runner bouncing off the rim as Deng slashed in from the left wing and put the rebound back with 1:05 left for a 94-91 Bulls lead. Stuckey missed a drive. But then it was Nate again — Hey, let some of the other kids play! — apparently out in space somewhere with a driving floater that again bounded well off to the Pistons, giving them a chance to tie the game with a three with 27.3 seconds remaining. But the Bulls, especially with Deng and Gibson on the perimeter switching everything, foiled the Pistons play, the clock eventually ticking down to force Detroit to try a three. Charlie Villanueva missed. Cook, who was doing a nice job defensive rebounding, got the ball and made one of two, which was enough space that Stuckey’s three with two tenths of a second left didn’t create another maelstrom. Well, it should be entertaining, anyway. It was Sunday for the Bulls after that discouraging loss in Dallas. The Bulls moved to 40-32 heading east this week for a potential playoff preview in Brooklyn with the teams now four/five in the Eastern Conference standings. Both Noah and Belinelli could be back by that Thursday game after Tuesday in Washington while there remains no word on Derrick Rose’s potential return. It was a much more relaxed and relieved Bulls team after the bounce back victory. Butler joked with Marquis Teague, who sits in the next locker stall, about “Kentucky guys” after Butler got hit in the face by Knight late in the first quarter. It appeared accidental and Butler agreed after Knight gestured following a traveling call, much as Carlos Boozer almost knocked out official Danny Crawford Saturday celebrating a basket. But with Butler down, Nate, of course, came running over to push someone and someone pushed Nate and there were some technicals and Butler got free throws for a flagrant foul as the Bulls finished the quarter down 24-20 after recovering from a 14-2 Pistons start of the game. It was either the Dallas loss or too many Peeps in their Easter baskets Sunday morning. Though talking about flagrant fouls, Thibodeau, who watches more basketball than the NBA-TV dunk editor, said he still can’t figure out what the NBA is talking about regarding flagrant fouls after Gibson had a flagrant from early in the Miami game — not in the fourth quarter when LeBron James complained — added. Gibson, against whom the foul was changed to a flagrant one, said he couldn’t even recall which foul the league was talking about since it didn’t seem significant and still thought the league changed the fourth quarter foul. Though the general consensus seemed to be James threatened to sit out Sunday’s game against San Antonio and hold his breath until They Called Some Flagrants On Somebody! And he might take his ball home. Well, they did and he sat out Sunday in San Antonio, anyway. Though the Bulls were a bit annoyed with themselves after that 15-1 Mavs ending to Saturday’s game. Butler, who missed two late free throws, said he slept two or three hours and came in extra early to get more shooting in. The Pistons, now 24-50, were a welcome sight and hardly any more rivalry. Not only was Sunday’s the 18th straight Bulls win over Detroit, but from 1993 into 1997, the Bulls won 19 straight over Detroit. And to think in the 1980’s the Bulls hoped to win one in a row over the Pistons. But to start the Bulls were overwhelmed by Detroit’s size with athletic rookie Andre Drummond grabbing rebounds over and around Nazr Mohammed and Monroe outmaneuvering Boozer. The Bulls help on defense was lazy and slow, and the Bulls were fortunate to trail just 57-53 at halftime as the Pistons were outplaying them with Stuckey having a huge 15-point second quarter offset some by Robinson’s 11. All teams scout extensively, but few break the opponent tendencies down as intricately as the Bulls under Thibodeau. There are detailed scouting sheets distributed to the players noting which hand opponents are using to dribble most, which spot they like to shoot from. And nobody still plays Manu Ginobili to his left hand. You got the sense early the Bulls had used those reports for a heck of a pregame paper airplane fight. The Bulls finally got back to Boozer on the inside in the third quarter and Boozer, who finished with 11 points and seven rebounds in just 22 minutes, had nine in the third, including a big baseline slam dunk after he rebounded a miss and Mohammed did a nice job sealing off Monroe from helping. Though Mohammed had some difficulties dealing with Monroe, his savvy saved some rebounds while Hinrich was good knocking the ball loose for three steals. Still, the Bulls trailed 74-71 going into the fourth quarter when Butler’s open court steals on cross court passes from Kyle Singler and Kim English ignited the Bulls to a 78-78 tie with 9:30 left. Butler dunked the second after admitting he messed up the first break with a low pass to Deng, though Deng got the ball back and was fouled and made two free throws. And just about anything else in this game. And then led the team in rebounding in the fourth quarter, gathering in vital misses and loose balls as the Bulls roller coaster season continued. And having some fun, like Sunday at NateWorld.